Last year I jumped on board the flocked Christmas tree craze, and while browsing the greenery aisles of At Home I noticed they had several items of flocked greenery available. 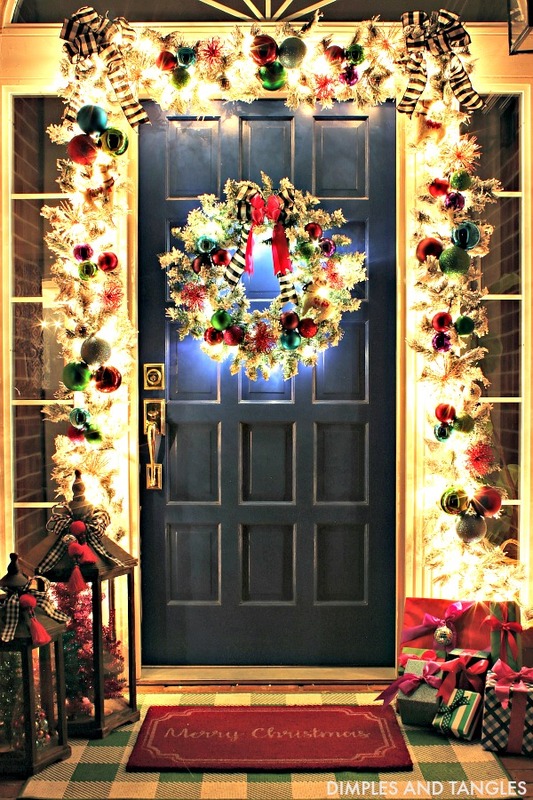 I purchased 2 pieces of the 9 foot flocked garland and hooked the ends together to make one long piece to drape around my front door. Mine did not have lights (there's a prelit one as well) but I picked up a string of 200 white lights to add to it which was just the right size. Then, I felt like a kid in a candy store looking through all of the boxed ornaments and individual ornaments from their various holiday collections to add to the garland. 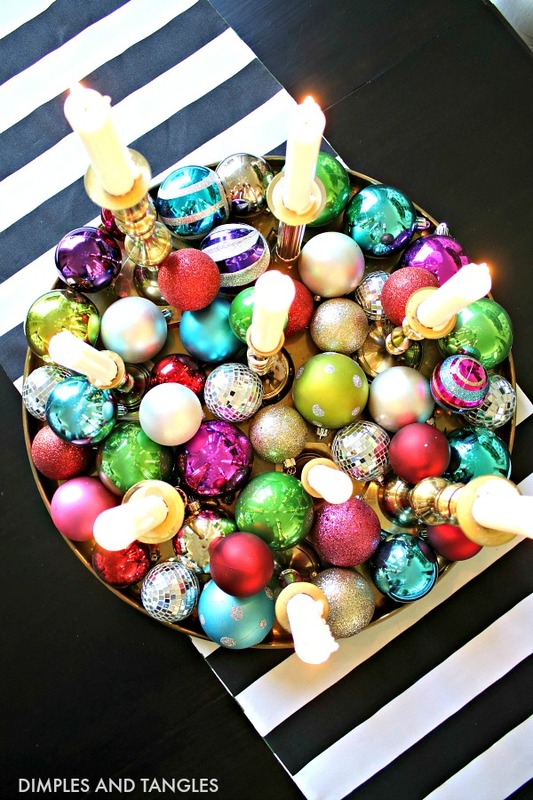 In my opinion, ornaments are probably the most versatile holiday decorations there are! 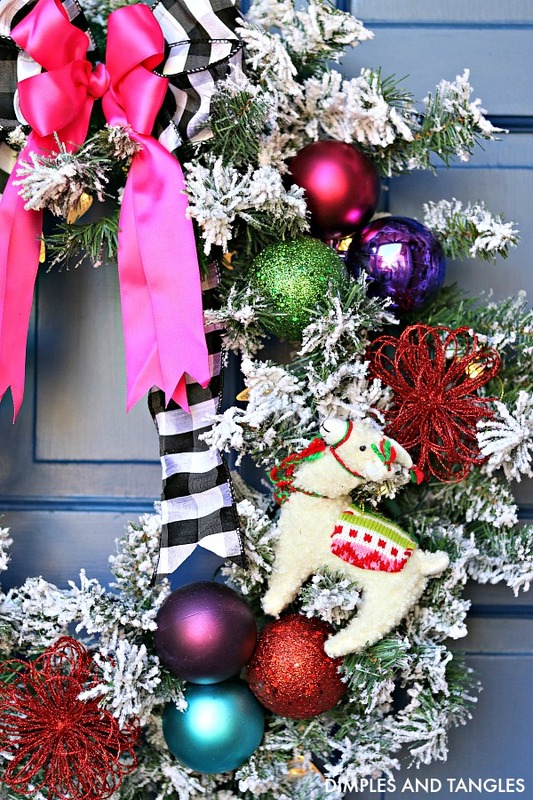 These are the ornaments I mix and matched on my garland- I love the texture, glitz, and shape that the pink starbursts and red flower ball ornaments add! 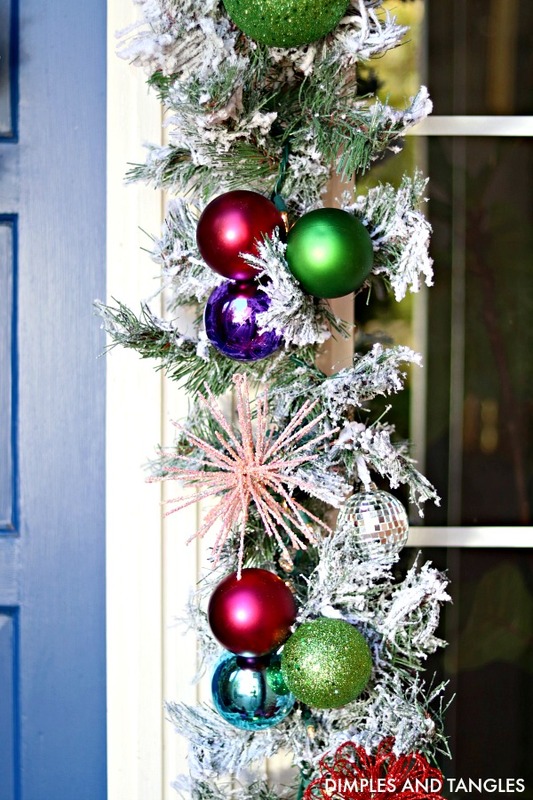 Adding clusters of ornaments to garlands or swags is so easy! I keep a stash of pipe cleaners handy (I think they're easier to use than floral wire), and just loop one through the group of ornaments I want to use, scooting all of the ornament tops close together and then twisting the pipe cleaner closed a few times. 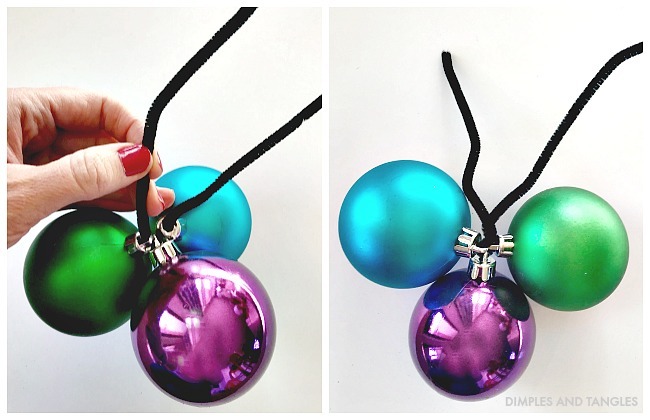 Just don't pull the pipe cleaner too tightly when you're twisting or you might pop a top off the ornament. Then, there is a good length of pipe cleaner ends to wrap around the garland and twist in back to secure the ornament cluster in place. For the door, I picked up a 30 inch flocked wreath (it comes lit or unlit also, I just added these battery operated lights to mine) and added ornaments the same way I did to the garland. The flower balls and llama ornaments only needed to be tucked into the flocked branches and they were secured enough. Can you even with the cuteness of those llamas??? 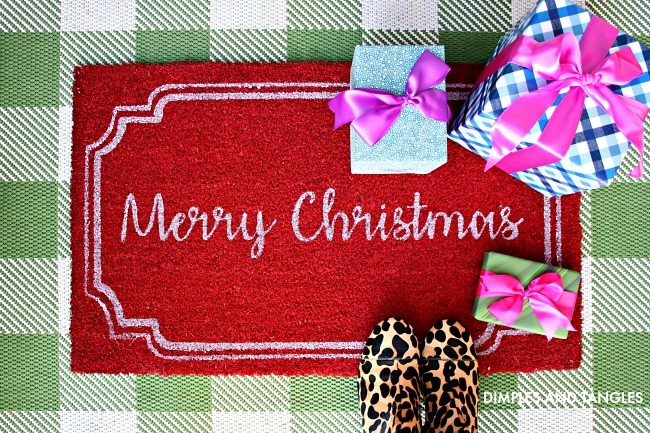 A festive Merry Christmas doormat finished things off nicely! I usually load my lanterns up with ornaments too, but this year I filled them with a few colored tinsel trees instead. And technically in the ornaments section, these tassel ornaments are the perfect embellishments to tie on the top. They come in 4 colors and the price can't be beat... I scooped up several to tie on packages, baskets, lamps... etc. year round. Everyone knows the magic of Christmas happens when the lights come on. I mean... there's not much better than the glow of Christmas lights! 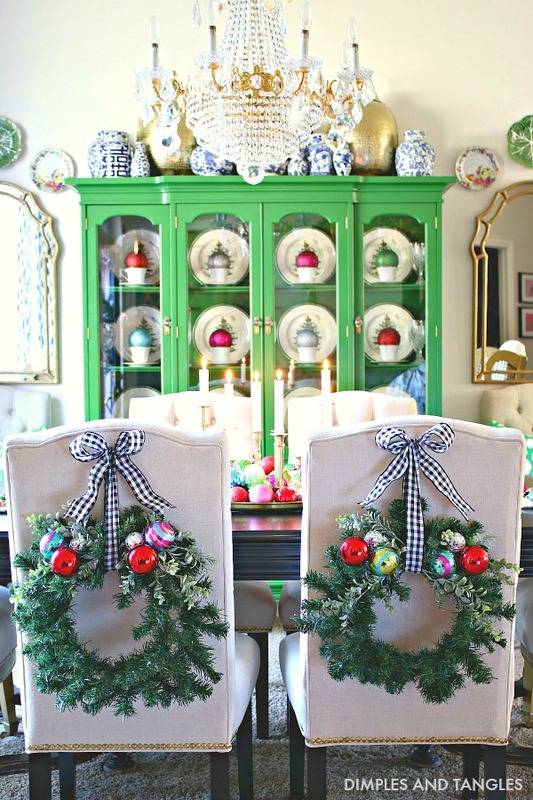 I absolutely love little wreaths added to dining chairs for the season, and found these simple pine wreaths that were just the right size. I kept them simple and added a few boxwood stems with glitter flocking to add some dimension, then tied on some small ornament clusters and a single bow. Chairs with spindle backs are easier to tie a ribbon on to attach a wreath, but with my upholstered chairs I just use a few corsage type straight pins through the back of the bow's knot and they stay in place just fine. Leftover ornaments from the garland with some candles grouped on a tray make the easiest centerpiece, and there's nothing to water or keep alive for the season! 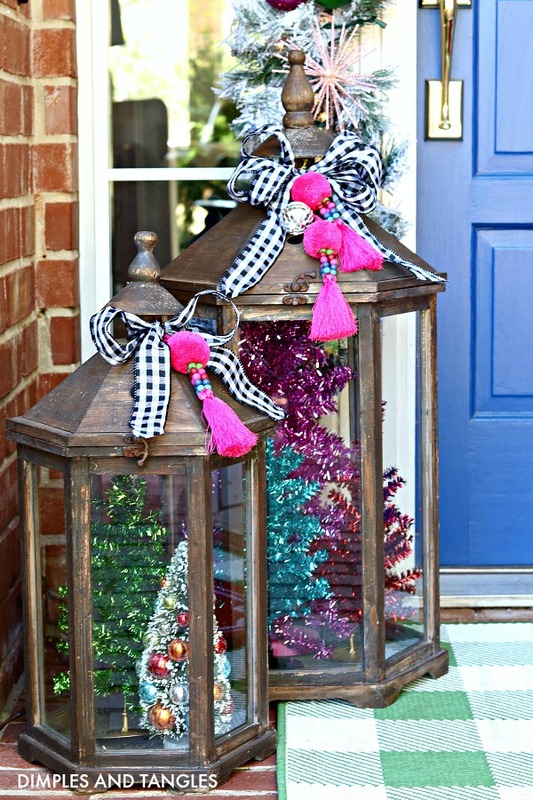 Lastly, I love to look outside of seasonal aisles when shopping for the holidays to find things that can be used not only at Christmas but year round. On the regular greenery aisle, I found this faux olive wreath that I just loved. 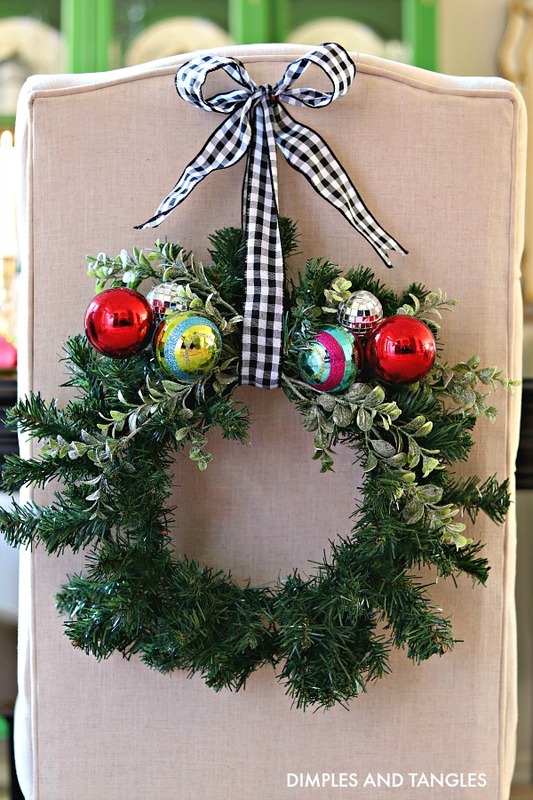 I'm always drawn to wild, natural looking wreaths and this one is a very good faux piece. 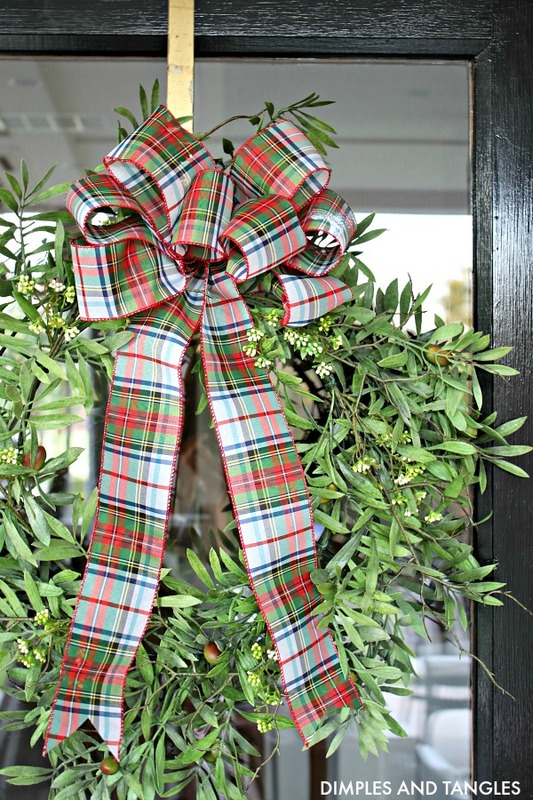 Keeping it simple, all it needed for Christmas was a good plaid bow! Then, it can easily transition to keep using it through the rest of the year by switching out the ribbon, or it's perfectly beautiful as is with nothing added to it. 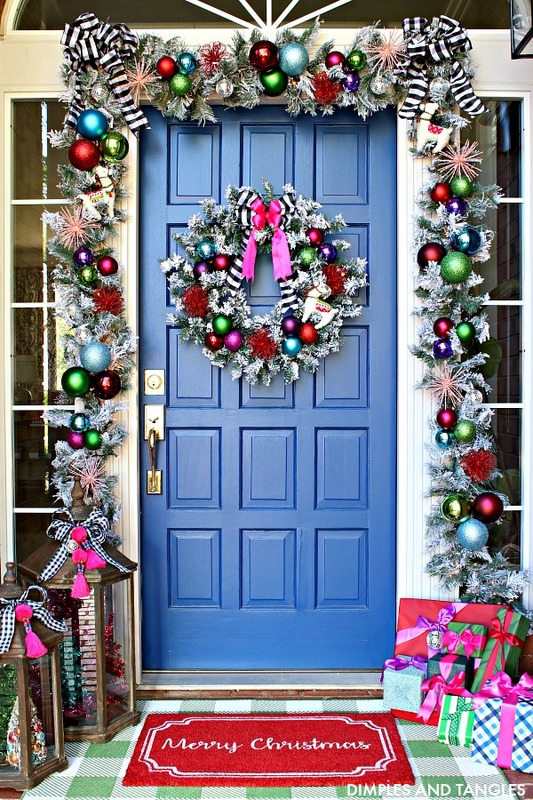 I'm looking forward to it's simple green shape on my doors through the rest of winter after the Christmas bow comes off. I also use these long needled pine stems well past Christmas, they look very realistic but without the mess! Find an At Home store near you here, and get your walking shoes ready... you won't believe the aisles and aisles of goodness to peruse! *This post is sponsored by At Home, but all designs, project ideas, and words are mine! 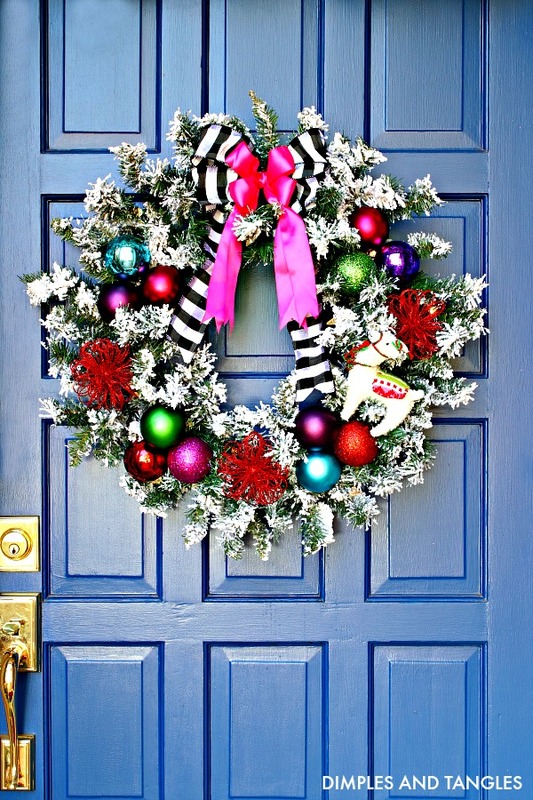 I looooove how you use bright colors year round even at Christmas time. you inspired me last year and I got super bright colors for my own tree! Thank you Ellen! 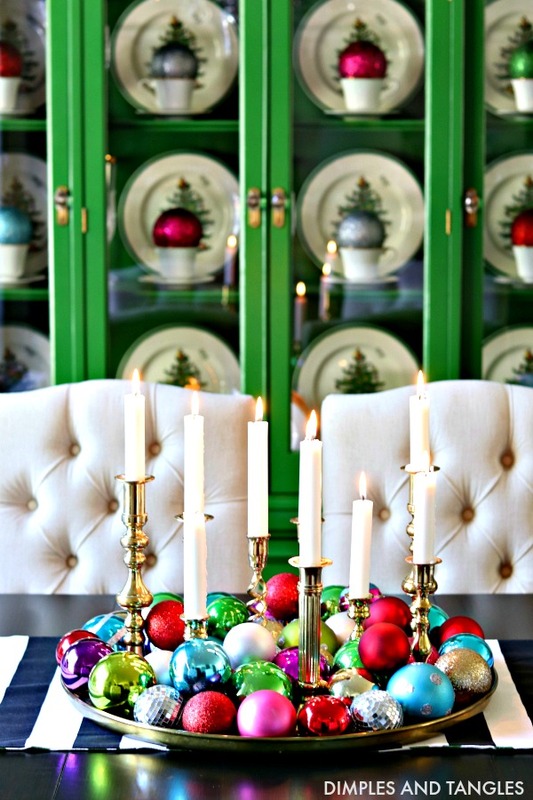 I’m always torn between “traditional” Christmas and bright but I’ve loved this palette for the past few years! Your design and color eye is spectacular and I just love seeing your creativity! The pops of bright decor warm my heart and make it pitter pat. I'm a new subscriber and get excited with each of your posts. Thank you for sharing your fabulous ideas and beautiful work! Thank you so much for following along, glad you’re enjoying the blog! Couldn't agree more with Ellen and Anita! In my own way, I'm following in your footsteps and love what has been done. Thank you Julie, glad you’ve found some good ideas! Love this post! As always, you've spotted the best finds at Home Goods. I've pinned my faves and headed there today. Hope those adorable llamas have made it to Kansas. And that wonderful olive wreath! Ohhhhh, the llamas! They are everywhere this year! We always have a couple at the children's barnyard at the state fair, they're my favorite to look at. So cute! GIRL! You are sooooo colorfully talented! Such an inspiration to all colorphobes. 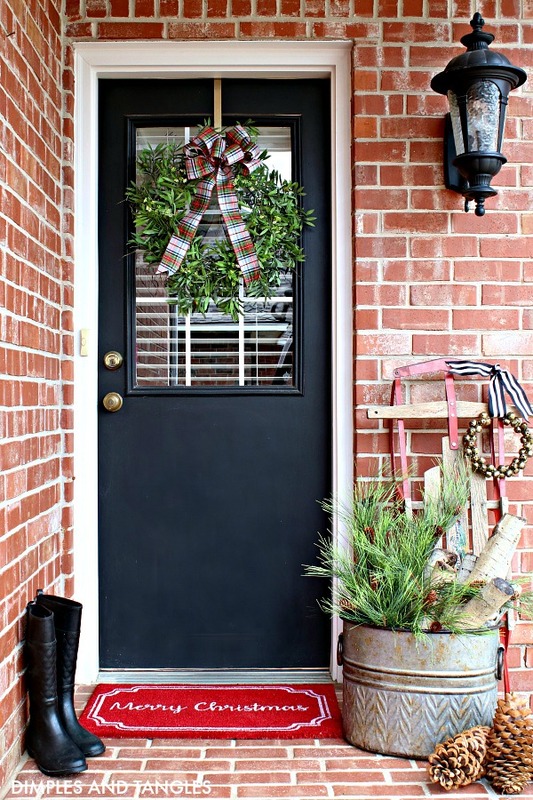 I just love everything about this, outside and in! Thanks for sharing!!! Love all this! 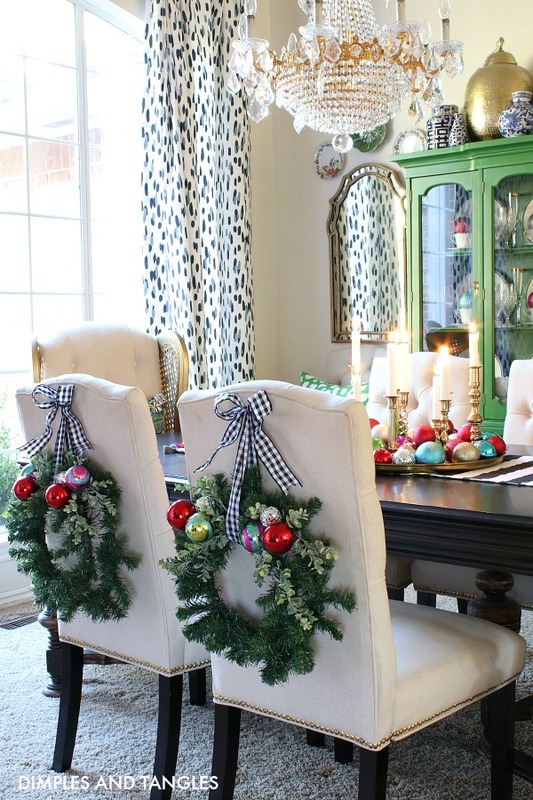 Where did you find the green and white gingham rug under your Christmas rug? Cute idea!! Hi Emily, it’s from Target. Love love love. Could you do a "how to tie bows" tutorial? I actually have an OLD one! Thank you so much for that encouragement, Patricia! L-O-V-E this so much!!! Can we talk about that fabulous black and white ribbon? Source please! Hi, I had it in my ribbon stash but I think I got it at Marshall’s last year. I love AtHome. 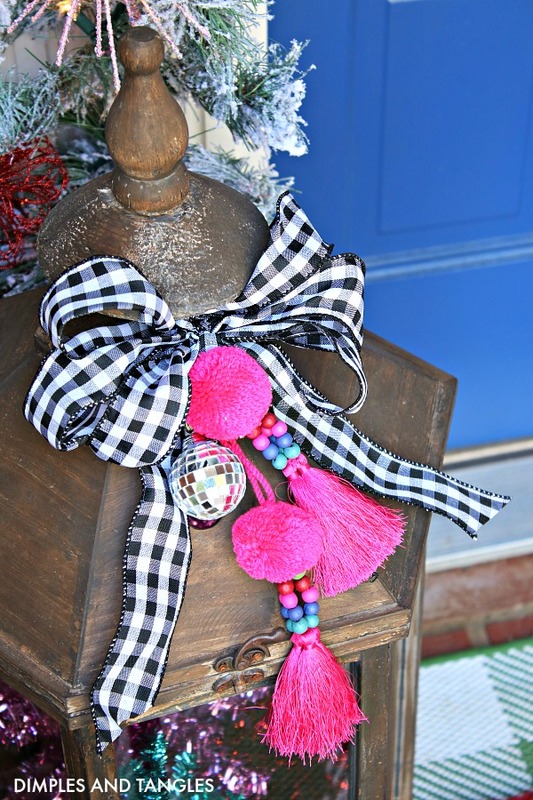 When I saw the Pom Pom tassel ornaments in the store last week I thought of you. I’m glad you incorporated them into your Christmas decor. 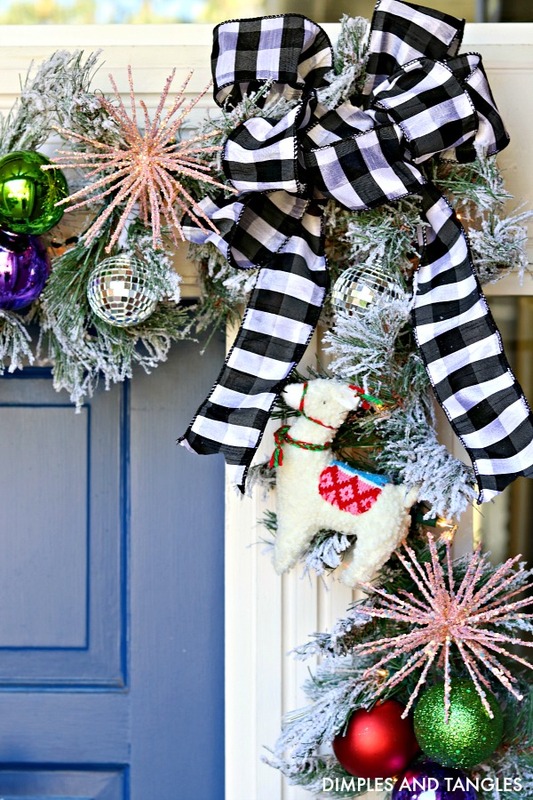 As always I love all the colors and the black and white ribbon is a great compliment. Certainly couldn't pass those up, they're great! Glad you love At Home too, Stacye!